Don't forget to enter for your chance to win select YA novels at my Lunar Love Giveaway/Hop (here). 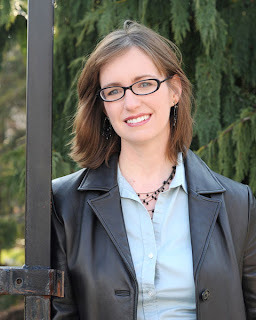 Kristin Bailey is a military wife and mother. Who enjoys spoiling her crazy pets. In the course of her adventures, she has worked as a zookeeper, balloon artist, and substitute teacher. 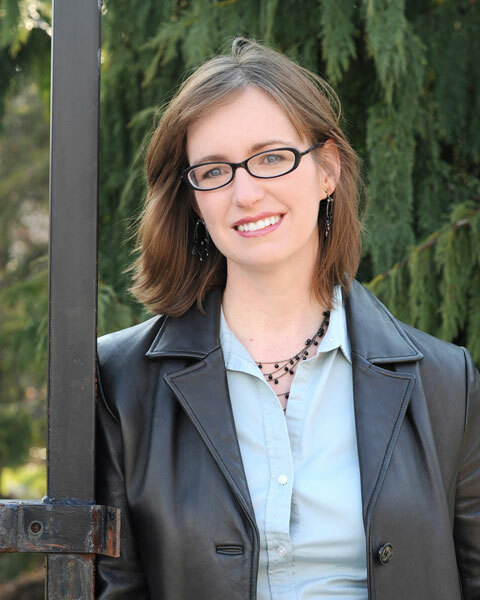 Now she enjoys writing books for teens who enjoy mystery and adventure as much as she does. Learn mind control. Wait, that sounds a little strange, like I'm planning to turn the entire planet into my evil minions, muah ha ha ha ha. No, seriously, learn mind control, as in learn how to control your own mind and how you react to intense emotional stimulus. This business isn't easy on the old brain. As a writer you can swing from elation to despair five hundred times in a single hour. At least, that's how it feels. From the wishes and hopes and dreams you send out with your first query, to the crushing blow of having that first query rejected, all the way to seeing your cover for the first time and then seeing your first bad review. This business is a roller-coaster ride, and it isn't for the faint of heart. The better you can take in the ups and downs of this business, breathe, relax, and focus on the future, the easier it becomes. My first instinct is to say my Jeni's Splendid Ice Creams at Home cookbook. It's the gift that keeps on giving, and it's giving ice-cream. For fiction, I have a special place in my heart for Frankenstein. Where did you get the idea for Legacy of the Clockwork Key? The inspiration for Legacy of the Clockwork Key came from a picture of a steampunk raven I stumbled across online. It looked a lot like this one. I was completely fascinated by the people who would imagine such a thing, then set out to create it as a work of art. Then as I was driving in the car on a very long drive somewhere, I pondered the nature of invention and what drives people to create things. I realized that some of our greatest feats of engineering are almost whimsical. That's when the Secret Order of Modern Amusementists was born. 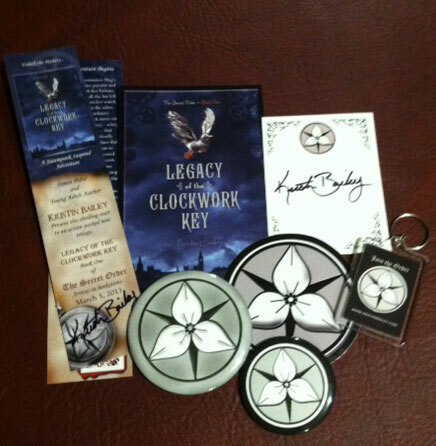 Did you hit any snags while writing Legacy of the Clockwork Key? What were they and how did you fix them? This book almost didn't happen. I had this fantastic idea, and I was so inspired by it I was possessed. I discussed the book with my agent, since it went in a very different direction than all my other writing she had seen. She said she liked the idea but warned me that young adult stories are tricky and I'd have to hit the voice just right, or no matter how good the story was, it wouldn't sell. So I sent her a chapter or two, and she was less than impressed. I revised it and tried again. It was still no go. I figured I couldn't do it. I couldn't give her what she wanted, so I tried to move on, but like I said, I was possessed by this idea. I focused all my heart into the story, and one day as I was pacing on the walkway in front of my butterfly garden, I started to hear the voice of a girl in my head. She started to speak to me and just tell me her story. That's when I realized, I had to write the book in first person. In that moment, Meg was truly born. 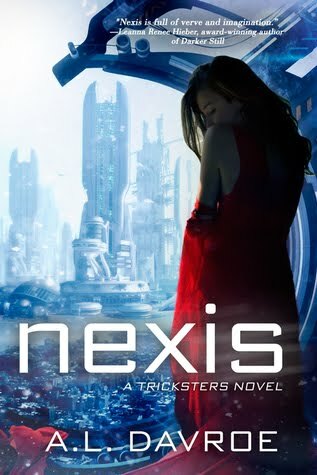 I gave it one final shot, and this time, my agent loved it, and thankfully so did Simon Pulse. Which one of the characters in Legacy of the Clockwork Key is your favorite and why? My favorite character is a guy named Oliver, who acts as an mentor or almost an older brother to Meg. He's wild and fun, and probably the character that is the most like me. For as much as I like him, I keep putting him in situations that nearly get the poor guy killed. I've been writing with the aim of having a career in publishing for over ten years. I married a military guy, and with how much we move, I needed a career that could travel with me. Writing seemed like the perfect option. I love doing it. I've been writing stories since I was seven, but the road to a sustainable career is a long and difficult one with no guarantees. I know I could not do this without the support of my husband. Sometimes I look back, and I can't believe how much I've learned and grown just doing my best to keep at it. I've had great joys, and bitter setbacks. I deeply respect all authors who give so much of themselves to make the best of this business. I am currently beginning to write the last book in the trilogy. That seems crazy since the first book is just coming out, but that's how writing timelines work. After that? I guess we'll have to see. I'm not sure where I'm going to go next. You were a zoo keeper?! How'd you land that job? And what did you do? And did you totally love it? I worked as a zookeeper during college and was part of the bird department. Mostly, I hauled five gallon buckets of flamingo food into a lake while wearing enormous waders, then running for my life away from the crowned crane who was territorial about his food dish. I still have a soft spot for parrots of all sorts. I did love it, but sadly, zookeeping was not the job that was meant for me. I have flat feet, and it was very hard to stay on my feet all day working with the animals. That's why I keep my own little zoo at home now. Would you consider Legacy of the Clockwork Key a steampunk novel? Why/why not? That's a difficult question to answer because I'm not sure I'm the one that will determine if it is Steampunk or not. I think the audience will have to decide. I didn't intend to write a "Steampunk" novel, I just wanted to write about Victorian inventors and Victorian inventors happen to get tagged as very Steampunk. The problem is, right now the Steampunk culture is growing, but it is very intense and filled with people who really embrace an all-encompassing vision of Steampunk. I think for that audience, there isn't enough other-worldliness to Legacy of the Clockwork Key. At the same time, people keep asking when Steampunk is going to take off and become a larger cultural phenomenon. Steampunk still needs that one thing, whether it is a movie, or a book, or a show, that a non-steampunk audience can understand so we can all take a deep breath and say, "Oh, that's Steampunk!" Then the Steampunk culture won't have to explain itself any more or run up against the "I just don't get it, is it history, is it the future, what?" issues. They can just say, "I'm into Steampunk, you know, like (insert cultural phenomenon here)" and everyone will understand what they mean. I don't know what that breaking point is going to be, but it's coming at some point. 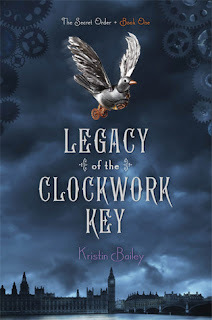 I like to say that Legacy of the Clockwork Key is Steampunk Inspired Historical Adventure, because it is inspired by the aesthetic and inventiveness of the Steampunk culture but it doesn't stray outside of a classic adventure story. Is it hard writing a historic novel? The thing that intimidated me the most about writing this book was creating an authentic Victorian London. I kept running into weird little things I'd have to research like, what Meg would have worn to bed, and ended up discovering strange and fascinating things like exactly how much horse poo had to be hauled out of London daily in the 1800's. I'm glad I tackled the challenge, and I hope I did the setting justice. Legacy of the Clockwork Key: A teen girl unravels the mysteries of a secret society and their most dangerous invention in this adventure-swept romance set in Victorian London.When a fire consumes Meg’s home, killing her parents and destroying both her fortune and her future, all she has left is the tarnished pocket watch she rescued from the ashes. But this is no ordinary timepiece. The clock turns out to be a mechanical key—a key that only Meg can use—that unlocks a series of deadly secrets and intricate clues that Meg is compelled to follow.